Volatility spiked for stock markets around the world last week. Higher in the volatility in the U.S. meant that indices such as the S&P 500 US stock index fell as much as 11.8% from its peak of 2,872.87 on January 26, 2018. The last time stocks had a correction, a decline greater than 10% from a peak, was two years ago in February 2016. With stocks climbing steadily higher over the last two years, it is easy to forget that stocks can also go down. A historical study that goes back to 1930 by Bank of America Merrill Lynch1 found that a 5%+ pullback happens about three-times a year, 10%+ corrections occur about once a year, and 15% downturns come every two years. The stock market is on a roller coaster ride. After a steady climb over the last two years, the roller coaster fell, correcting by more than 10% from its peak. Ups and downs may be more frequent in 2018 as the stock market figures out how to interpret developments. Many of the reasons cited for why stock markets corrected last week were also the same ones used to explain its rise. The reasons include inflation or pricing power, Jerome Powell as the new Fed Chairman overseeing interest rates, a strong job market, tax cuts and fiscal spending. Optimists view a strong job market as support for continued economic growth. Pessimists view a tight job market means that the Fed may be more aggressive in increasing interesting rates in order to stem the risk of the economy overheating. Optimists see inflation as a sign of pricing power, the ability for businesses to raise prices, which is good for profits. Pessimists see inflation driving up interest rates, raising the cost to finance business and a threat to growth. Optimists believe tax cuts will boost profits and would dub the increase in fiscal spending as stimulus spending. Pessimists see tax cuts as moves that increase the budget deficit and would label fiscal spending as deficit spending that would increase our national indebtedness. President Trump’s proposed budget for 2019 calls for more spending on infrastructure and other projects that would add $7 trillion to the federal deficit over the next 10 years. More borrowing means that the US Treasury will issue more bonds to finance its spending. The law of supply and demand says that more supply should lower the price of bonds, which translates into higher interest rates. We continue to be cautiously optimistic about the current investment environment. We are optimistic because business and economic fundamentals are solid. Earnings are improving, businesses have good access to capital for growth, the job market is strong, and the tax cut should boost business profits and increase disposable income for families. Interest rates remain low, and we believe global central banks will continue to maintain their easy money policies until they believe inflationary pressures are apparent. Our caution stems from the valuation of stocks in the US and the risk that interest rates may increase faster than expected. Stock valuations are high by historical standards, but are reasonable because of low interest rates. The linchpin is the lack of inflation pressures, which allows central banks to maintain easy money policies and for bond investors to keep long term interest rates low. Stocks and bonds are both vulnerable to higher interest rates, but we continue to believe that the risk-reward relationship continue to favor stocks over bonds. So far there has been little talk about panic selling in response to the correction last week. That is great news because investors can be their own worst enemies when emotions dictate investment decisions. Some of the best things to do now is to block out distractions and to stick with your investment plan. If your situation has changed since you last reviewed your investment plan, now is the time to update it and make sure it is consistent with your needs. Articles by Jason Zweig in the Wall Street Journal and Ron Lieber of the New York Times are good reads on these topics. At Candent, this is one of those times when your investment policy statement comes in handy. Your investment plan is described in your investment policy statement. The statement describes why you invest and how your investments will be managed. It is based on your goals, situation, investment needs, risk tolerance, and guidelines for your investment portfolio. Have your goals changed? Do you need to tap into your portfolio soon? Have your earnings changed? Did the market downturn disrupt your ability to sleep? If you answered yes to any of these and related questions, it is time to update your investment policy statement. An investment plan is like a game plan in sports. It is more about preparation and establishing guidelines to keep you on target than it is a step-by-step recipe. Staying with the plan is to stay invested using the guidelines laid out in preparation as opposed running for the exit that emotions may dictate. The historical evidence makes a very strong argument for staying in the game. Daily returns show that less than 1% of the days determine the value of your investment portfolio. In short, tails drive returns. Over the last 30 years, the gains from the top 51 days or 0.7% explain all of the gains in the S&P 500 stock index for the entire period. What would have happened had you missed some of the days? Missing a few days can be devastating. 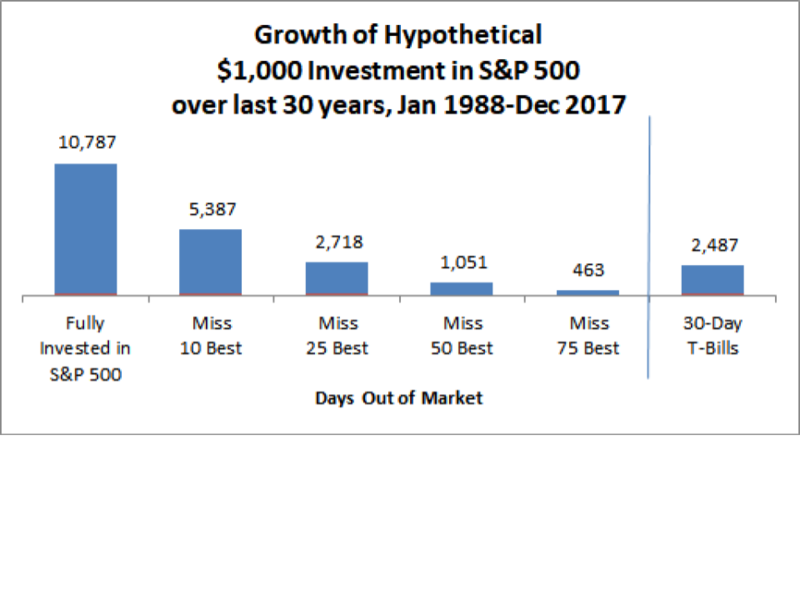 The chart below compares the growth of $1,000 hypothetically invested in the S&P 500 for 30 years between 1988 and 2017. The $1,000 would have grown to be $10,787, excluding dividends and reinvestment. But, missing out on the 10 best days would have cut the ending value by half to $5,387. Being out for the 25 best days would cut the value in half again to $2,718, not much better than risk-free Treasury bills. Being out for the 50 best days would leave someone slightly better off than stowing the money under the mattress for 30 years. A few days determine stock investment returns. Indices are not available for direct investment. The performance of indices do not reflect the expense associated with the management of an actual portfolio. Past performance is not a guarantee of future results. Revisit investment policy statement – why you are investing, your situation, time horizon, and the plan. Has anything changed? Update as needed. Keep Diversified. Rebalance as needed. Keep expenses and turnover down. (1) “Market pullback through a quant lens,” by Bank of America Merrill Lynch, February 6, 2018.